Upgrade to the 8:10am tour and not only will you skip the long lines (which can last up to two hours!) to enter the Vatican Museums but gain access as soon as the doors open - before the general public step foot inside! Tours are arranged exclusively for our guests and groups never exceed 10 people in total. No upgrades available on Wednesday. 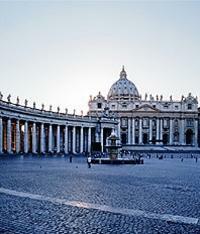 Do you want to see the Vatican Museums and Sistine Chapel at Night? Upgrade to the 7:30pm tour and gain access to the museums after the official closing times – an opportunity available for a strictly limited season. The general public are not permitted into the Museums in the evening – you must pre-book a guided tour to gain access. Hurry! The season will run from the 6th of May 2011 every Friday until the 15th July. Then it will stop to start again from the 2nd of September until the 28th October.